Grant Park is a nationally recognized historical district, chock full of sites such as Zoo Atlanta, the Cyclorama, and Oakland Cemetery, where local figures such as Margaret Mitchell are buried. The boundaries are easier to see on a map than understood from a verbal description. Many of the homes in the area are Craftsman bungalows, although renovated Folk Victorian, English Vernacular Revival, Shotgun/Double Shotgun, and Queen Anne styles can also be seen throughout the neighborhood. Grant Park, located just minutes from downtown, was torn apart for the construction of I-20, and its success as a neighborhood continues to be challenged by this split. Residents joined together to form the Grant Park Neighborhood Association as well as the Grant Park Conservancy, both of which actively work to reinvigorate the area. The Grant Park neighborhood was named for Lemuel P. (L.P.) Grant, a civil engineer for the Georgia Railroad who has been called the “Father of Atlanta.” As an agent for the Western Railroad Company and the Georgia Air Line Railroad, Grant helped to bring the railroad to Atlanta. During the Civil War, in his capacity as chief engineer for the Department of the Militia, C.S.A., he planned and supervised the construction of defensive lines around the city. After the war, he continued to serve the city as a member of the committee that named streets, member of the city council, Board member of the Bank of the State of Georgia and served on the committee to draft the new city charter in 1873. Grant lived in a huge 1858 Italianate mansion on what is now St. Paul Avenue in the center of his vast land holdings. This mansion was purchased by the Atlanta Preservation Center in December 2001 and is now its home. Between 1853 and 1883 the city acquired all of the land where Oakland Cemetery and the Park itself now stand, by gift or trade from Col. L.P. Grant. The remaining parts of Col. Grant’s property were subdivided between 1885 and 1905 as the building boom began on all four sides of the city’s new park properly named the L. P. Grant Park. What makes living in Grant Park special? 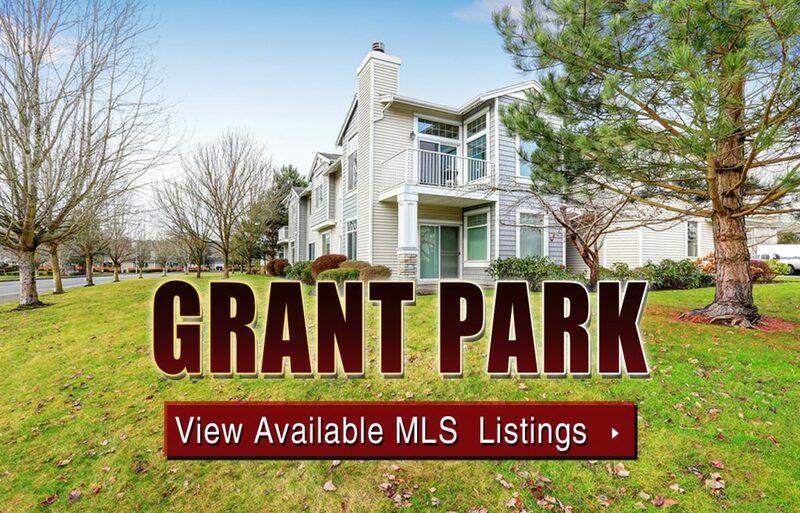 Before searching Grant Park homes for sale, read more about the neighborhood below! Grant Park, as a neighborhood, began to be populated in the 1890’s by upper middle class families. Craftsmen built many of the architecturally distinctive homes you see today. Most of the lots were shallow and narrow with unpaved alleys in the back of the houses, from the days when the city sewerage wagons had to have access to the outhouses. The neighborhood reached its zenith around 1905. Shortly after the turn of the century, the neighborhood’s battle with the automobile began when some of the wealthier residents, who could afford to buy cars, were drawn to such faraway places as Druid Hills, Morningside and Buckhead. Grant Park remained upper middle class into the 1950’s. In the 1960’s, the automobile, in the form of six-lane I-20, was responsible for cutting the neighborhood in half. Grant Park was severely disrupted and declined in the wake of I-20’s construction. A restoration trend began in Grant Park in the early 1970’s and the neighborhood began to blossom in the late 80s and into the 1990s. Demolition of older homes has largely been halted and new construction seeks to conform to the character of the old neighborhood. During the 1980’s, the entire area, both north and south of I-20, was placed on the National Register of Historic Places. Grant Park today is a mixture of the old and new residents with people of all levels of education, age and racial backgrounds living in the same neighborhood. Today, more than a million visitors visit the park every year. Kids attend award-winning Atlanta Public Schools. Boulevard and Memorial Avenues are the main commercial thoroughfares in the neighborhood. Along Boulevard you will find such diverse restaurants as Agave, Nayarit Taqueria, and The Scratch Factory. Daddy D’z, Six Feet Under and Ria’s Bluebird Cafe line Memorial Avenue. The neighborhood association sponsors a home and garden tour each September, which is a great introduction to the variety of home and life styles you will find in this neighborhood. Can’t find what you’re looking for in Atlanta’s Grant Park neighborhood? Start browsing other Atlanta real estate for sale or give the Zac Team a call at (404) 564-7200 for help with your new home or condo search today!